It took me a while to finally get around to posting a review for this book, which probably makes sense given how long it took me to actually finish reading it to begin with. And while the works of Haruki Murakami aren't typically known to be light or casual reading by any standards, this book was definitely a bit of a challenge to get through due to sheer length beyond anything else. Now I don't claim to be some literary expert and thus those landing on this review hoping to pick up something that might be usable in a term paper based around the book are out of luck. While I will do my best to express my honest opinion about the title, I don't necessarily claim that I'll be following any sort of pattern related to more "established" schools of literary theory and the like. But I am a major Murakami fan, and that's the perspective that you can expect here. I've read most of this books and I'd like to think I've walked away with a decent enough understanding of the various books and stories. But this may definitely be a case of not fully getting things on the first go and I'm not quite sure I'm willing to go through the book once more any time soon just to get a better grasp of things. 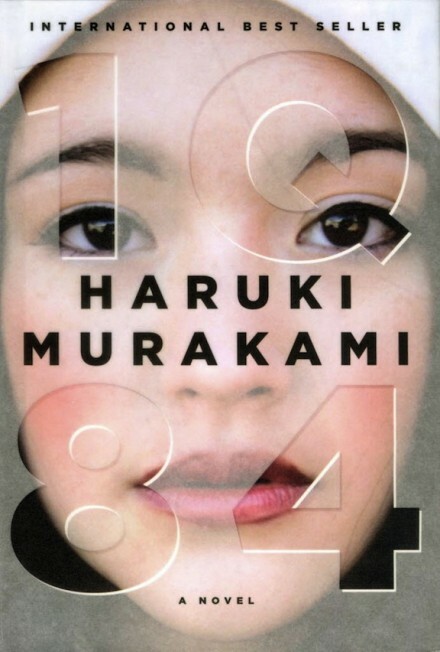 1Q84 was originally released in three volumes in Japan over 2009-2010, but was eventually released as a single volume for English readers in 2011. The title and aspects of the book were stated to be an homage of sorts of George Orwell's 1984. 1Q84 initially follows two narrative tracks - one for a young woman named Aomame and another for a young man named Tengo. With alternating chapters we switch between these characters and their respective story tracks - at least until a third narrative path is defined later on. With Aomame, we meet her busily on her way to a particular destination when he cab gets snarled in traffic. As she listens to Janáček's Sinfonietta playing on the cab's radio, the driver suggests that she disembark, take the emergency stairs down and then walk to the nearest subway station to still make her appointment. But he also warns her will change her life forever, yet fails to explain what that means. Despite the odd warning, she takes his advice and makes her way down the emergency stairs, indeed changing her life more than she could ever imagine. On the flip side we have Tengo, a math teacher who happens to have a passion for writing as well, although he has yet to produce anything worth publishing. Komatsu, his editor, asks him to perform a ghost rewrite of a literary competition story that has a lot of potential despite somewhat awkward pacing and style. Should the novel win the prize, who is just a young high school girl, then it could mean good revenue from book sales for the publishing house. The ethics of the situation concern Tengo, but he reluctantly agrees given his trust in Komatsu. The novel flows in this manner for the most part - back and forth between the two character tracks. And thus in the beginning it does end up feeling like you're reading two separate books that happen to be put side-by-side. The characters are busy with their own exploits in different parts of Japan and it's not immediately clear that it's going to lead anywhere. But it's a Murakami novel and so you hold on to the belief that it will end up at a point when the paths converge. Just don't expect that to happen any time particularly "soon" in terms of the book. Another thing to be wary about is how the jumps in perspective don't guarantee that characters are moving at the same pace. This is an important thing to remember since we as readers rely on a sense of time to make sense of things. And while Murakami doesn't necessarily have them trapped in past and future or anything dramatic like that - but he does keep things just a little bit askew from chapter to chapter, making it that much trickier to make sense of things. The book does make reference to 1984 a lot, that much is clear. But this is not some allegorical way of going about things or a clever use of metaphors. They instead use direct quotes from the book, mention the book a lot and terms that come with the book like Big Brother or the Thought Police. So this wasn't a homage in the typical sense, but it was Murakami's interpretation of what a homage should be. And thus you know you're going to have something that you weren't quite expecting indeed. The book has a weird meta-plot to things, which is natural given Tengo is a writer. Thus he makes a number of statement about the act of writing and so does his editor Komatsu and a few other characters. It naturally makes you wonder if these are statements directly from Murakami, but at the same time long time readers of his works wouldn't think he'd ever be that straightforward in terms of his fiction. Tricky, tricky indeed. The story is a complex one - a tale that has us following one o the strangest approaches to romance and with a third character arc in the third act that doesn't quite fit in. You have a supernatural element, which is common in his books. But you also have weird pseudo-science and some cloak and dagger action to boot, which is somewhat different for Murakami save perhaps things we've seen in books like Hard-Boiled Wonderland and the End of the World. And I still enjoyed those bits. And then there are the Little People, and I have no idea what to do with that part of the story. 1Q84 is, more than anything else people will say it might be, a true Haruki Murakami novel. It's littered with odd bits of fantasy, pop culture and jazz music. It paints the shape of Japanese culture but not in a manner that is easily interpreted. And it's all in a language that is unique to itself. It's still a beautiful book, but one that I can imagine to be difficult for other readers to appreciate (and some fans are included in that statement). Thus I rate the book 3.5 uses for slender little needles out of a possible 5. I'm listening to an audiobook version of this book, which is of course a bad idea as it (at least for me) requires a lot of concentration. I tend to zone out of it during long LRT rides; I intend to finish it though. Thanks for giving me a heads up on how LONG it would be. Yeah, definitely not the kind of book I'd associate with somewhat casual reading, even as an audio book.